Admirers of the alpine Christmas time can enjoy themselves once again in our pearls. The aroma of cinnamon, mulled wine and fir trees is in the air already! Winter temperatures and genuine tradition are creating a unique Christmas atmosphere right in front of a breathtaking mountain panorama you can only experience in the alpine pearls. Let yourself become enchanted from the Christmassy blaze of lights, enjoy the extraordinary advent markets and their rich cultural and culinary offer, treat yourself with delicacies and reverently listen to amazing performances. Experience a unique atmosphere in the festively decorated centre of town, taste culinary delights and listen to the Christmas sounds of chorals and wind players. 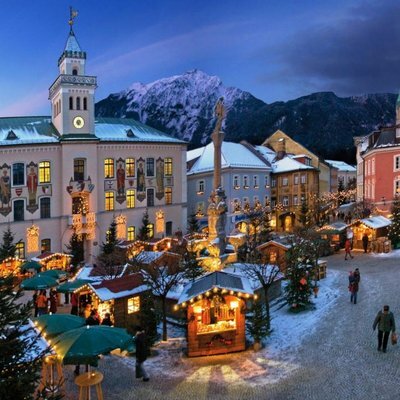 Several advent markets as well as a nice advent walks await you in Bad Reichenhall. A true inside tip! Characterized by tradition, authenticity and impressive art and craft work this outstanding Christmas fair is definitely worth seeing. Adventurous market atmosphere for children as for adults, display models and music are presented by the respective artists. Christmas village at the promenade next to the lake with stands offering festive gifts and typical food and drinks from the Gorenjska region. Advent choir which sings christmas songs, in order to get in the right mood for Christmas. Enjoy magical pre- Christmas atmosphere with traditional brands and choirs. Come to experience the magic of Christmas in Valdidentro. With ICE MAGIC, a unique ice skating experience that transforms the centre of Interlaken into a winter wonderland. Experience the impressing reincarnation of the legend and watch the sinking of the bright illuminated bell on 25th of December. The team of Alpine Pearls wishes a merry Christmas season.